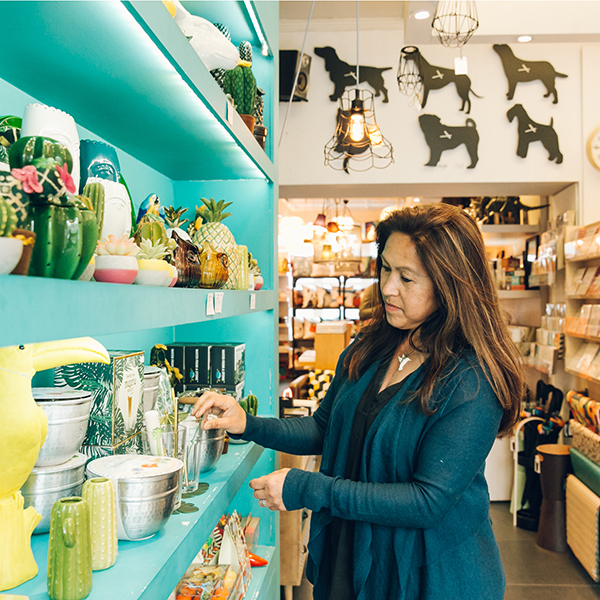 Based in the heart of Brighton, England at Home is a bright and colourful collection of gifts and homewares. Founded by husband and wife duo Bob and Therese England, the business is made up of two boutiques across the road from each other. With Therese's experience as a buyer and their passion for design, England at Home is constantly evolving, with products being regularly rotated to ensure customers get the same exciting shopping experience, every time. "We wanted to create a space that we could fill with beautiful and bold objects, combining our passions for design and experience in retail. We find real joy in updating and refreshing our stock, and seeing our customers enjoy it." Hailing from Sydney, Australia originally, Therese was working as a retail buyer when she met her now husband Bob. After travelling for 12 months, the couple decided to settle in the UK and open up shop. 23 years later England At Home now spans across two retail spaces and is filled with colourful products all selected by Therese herself.